Expedia has some Larre travel packages ready and waiting for you. Combining your flights and lodgings is one of the easiest ways to save cash on your adventure. Receive savings of as much as C$590* by booking a package deal on Expedia. Search our intercontinental database of more than 400 partner airlines and 321,000 properties worldwide. Too many on there to choose from? Don't stress — we can help you decide! You don't have to worry about altering your family's plans, as we don't charge additional cancellation fees for almost all of our hotel bookings. Nearly ready to take off on your Larre vacation? Can't work out what sorts of things to put on your travel itinerary? No need to stress — we're here to give you a few of our recommendations. If you’re looking for some spiritual enlightenment on your getaway, pay a visit to Church Saint Alban. Who knows, you may even glimpse the answers to a couple of life's most mystifying questions! Travelers have heaps of options in and around this destination. Explore the age-old rooms and corridors of Chateau de Largoet. This impressive fortification offers an educational day out for young and old. Still have time to spare? The link to ancient history is powerful at Dolmen de la Loge au Loup. Make a booking now and uncover the evidence of skilled archaeological research. 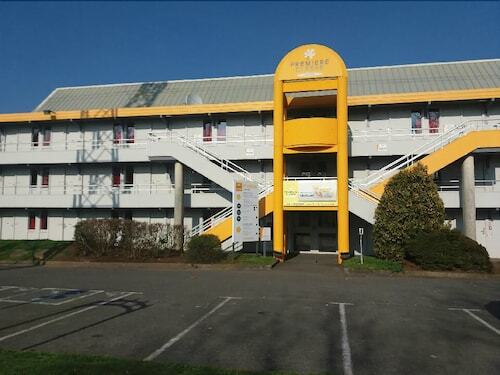 As Larre has no properties featured on Expedia, travelers might find it convenient to stay at the Villa Kerasy Hotel Spa (20 Avenue Favrel et Lincy) or the Best Western Plus Centre Vannes (6 Place De La Liberation), two more high-end options located 8 miles (13 km) away in Saint-Nolff. Some more affordable Saint-Nolff options are the Appart Hôtel Le Liberté (6, Place de la Libération) and the Golfe Hotel (91 rue Winston Churchill). If you're coming in by plane, it's likely that you'll be landing at Meucon Airport (VNE). Once you've grabbed your suitcase from baggage claim and wandered out of terminal, the central area of Larre will be just 11 miles (18 km) away. 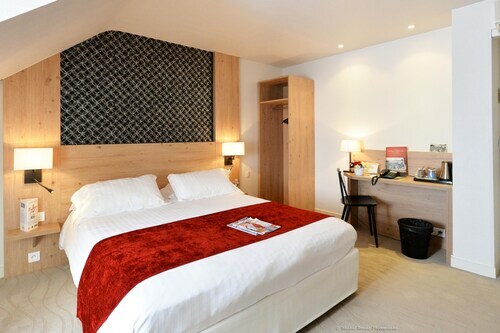 Situated in Vannes, this hotel is 0.1 mi (0.1 km) from ZAC du Chapeau Rouge and within 3 mi (5 km) of Old Town and Vannes Cathedral. Musee de La Cohue and Chateau Gaillard are also within 3 mi (5 km). 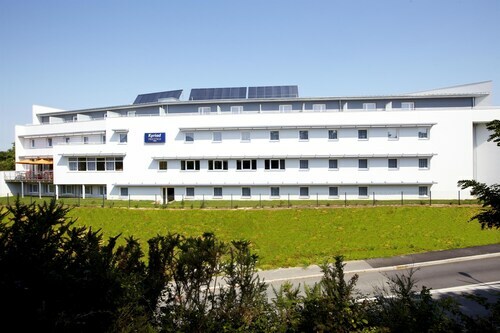 Situated in Vannes, this hotel is within 2 mi (3 km) of Old Town, Gulf of Morbihan Regional Natural Park, and Palais des Arts et des Congres. Place de la Republique and Chateau Gaillard are also within 3 mi (5 km). 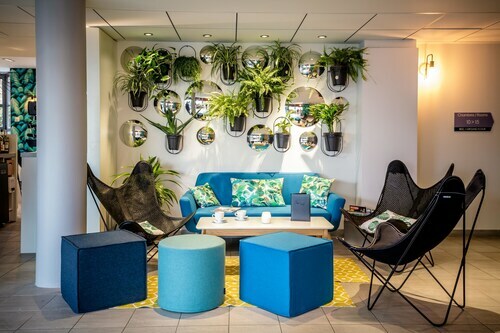 Located in the heart of Vannes, this eco-friendly hotel is within 1 mi (2 km) of Palais des Arts et des Congres, Vannes Cathedral, and Place de la Republique. Vannes Marina is 1 mi (1.7 km) away. Vannes Station is 13 minutes by foot. Located in the heart of Vannes, this hotel is within a 10-minute walk of Old Town, Palais des Arts et des Congres, and Place de la Republique. Vannes Cathedral and Musee de La Cohue are also within 10 minutes. Vannes Station is 17 minutes by foot. Situated in the suburbs, this residence is within 1 mi (2 km) of Vannes Aquarium and Old Town. Jardin aux Papillons and Vannes Marina are also within 2 mi (3 km). 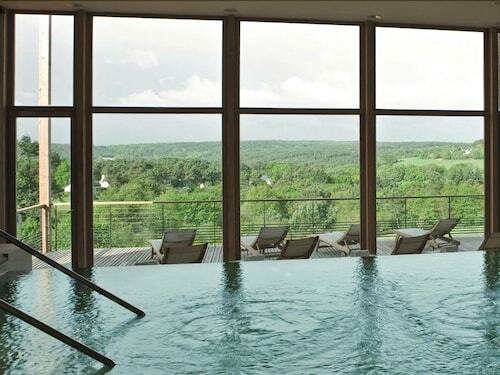 Situated in a rural location, this spa hotel is 2.7 mi (4.4 km) from Yves Rocher Botanical Garden and within 9 mi (15 km) of Saint-Sauveur Church and Musee de la Batellerie. Les Menhirs de Monteneuf is 12.2 mi (19.6 km) away. 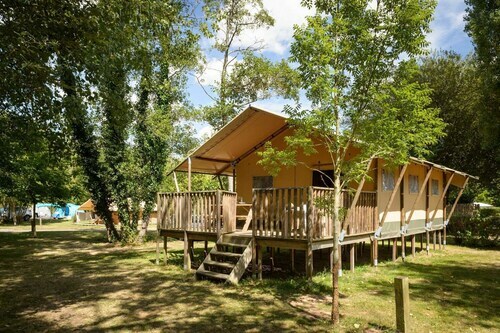 Situated in Sixt-sur-Aff, this campground is 1.9 mi (3 km) from Yves Rocher Botanical Garden and within 12 mi (20 km) of Saint-Sauveur Church and Musee de la Batellerie. Les Menhirs de Monteneuf and Ecole Speciale Militaire de Saint-Cyr are also within 12 mi (20 km). Located in the heart of Vannes, this hotel is within a 10-minute walk of Old Town, Place de la Republique, and Palais des Arts et des Congres. Chateau Gaillard and Musee de La Cohue are also within 10 minutes. Vannes Station is 17 minutes by foot.